This article was first published at the NYRBlog on June 26, 2012. 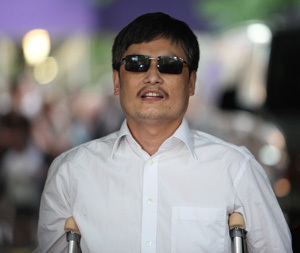 The Chinese legal activist Chen Guangcheng arrived in the United States last month following top-level negotiations between U.S. and Chinese officials. Several weeks earlier, Chen had dramatically escaped from house arrest in his village in northeast China by jumping over a wall at night and making his way via an underground network of relatives, friends, and supporters to the U.S. embassy in Beijing, hundreds of miles away. In May, an agreement was reached to allow the forty-one-year-old Chen to leave China with his wife and two children to study at New York University’s law school. With the help of NYU professor Jerome Cohen, Chen—who is blind after a childhood fever destroyed his optical nerves—will soon begin learning about disability law in the United States, which he hopes will help him improve disability law in China when he returns. I spoke to Chen last week in a classroom at New York University. Ian Johnson: How do you account for Chinese officials’ frequent disregard of China’s own laws? Is it a lack of checks and balances—that officials think they can get away with anything so they do anything? Chinese activist Chen Guangcheng makes remarks to the media upon arriving on the campus of New York University on May 19, 2012 in New York City. China allowed the activist to leave a hospital in Beijing and board a plane for the U.S., a move that could signal the end of a diplomatic standoff between the two countries. Chen Guangcheng: It’s also that they don’t dare do the right thing and don’t dare not do the wrong thing. Chinese police and prosecutors, do you think they don’t understand Chinese law? They definitely understand. But these people illegally kept me under detention. They all knew [that what they were doing was illegal] but they didn’t dare take a step to rectify the situation. They weren’t able to. Why is it like this? A Xinhua News Agency journalist came and saw me twice; as a result he lost his job. So you can see that once you enter the system, you need to become bad. If you don’t become bad, you can’t survive. A very important factor is the atheistic education system. Another reason is that officials give up conscience and morals for their own interests. They don’t want you to speak the truth, so you don’t dare to. If you speak the truth, how can you gain maximum advantage? If you want to get ahead, you have to speak lies. Chinese people often say there is a spiritual crisis, that there’s nothing that people in China won’t do to get ahead. What you’re saying is only partly true. You say “in China” but that’s incorrect. But it’s entirely correct to say “among those who are serving as civil servants.” In the countryside they still follow traditional virtues and ways of behavior. Doesn’t the Communist Party have more than 80 million members? But most of them are local officials. Most are the same as ordinary people. The number of those in power is really limited to a few tens of thousands. You can’t say that all 80 million are bad. You grew up in the countryside. In your family, did anyone believe in a religion or have some sort of faith—Christianity, Buddhism, or folk religious belief? No, nothing organized like that. But there was a traditional belief in virtue that’s present in Chinese culture—that might have some Buddhist content, but not necessarily that one believes in Buddhism. It wasn’t so much a religion as a social virtue that people have, a logical extension of virtue. Does the Chinese government then need some sort of political reform or a reform in virtues? I don’t think it’s about reforms. It is that the society is developing and the spread of information is gradually becoming transparent. People’s desire for kindness, or the deep-rooted conscience implanted in people’s bones can’t be destroyed by violence. They can’t stop the tide of history. People [abroad] often just focus on elites in China’s cities. If they do, they will completely misunderstand modern-day China. The most important cases over the past year come from the countryside. Westerners like to train local officials, to improve their understanding of the law. But when there’s been an improvement, it’s not because of improving the quality of officials; it’s because ordinary people grasp the law and push. For example, the cases of Duo Maomao, Sun Zhigang, the students crushed in the 2008 earthquake, or even my case—they’ve all been because ordinary people have pushed and pushed for change. So the decisive pressure for change is at the grassroots level. It’s interesting because their economic situation is grim. These aren’t wealthy activists. Yes, you wouldn’t believe how little money I had when I did my survey of rural peasantry and forced abortions. I didn’t need money for accommodations or food because I was always put up by local people. I just needed travel money, for example, for buses or taxis. But I often didn’t have it. I had a really really hard time to travel just because I lacked the money. If I had had 5,000 yuan I wouldn’t have limited myself to a few counties but I could have expanded my survey to a few provinces! This was in 2005. And your family was still so poor? Ahh, maybe you don’t know my village. When I went to school I’d be happy if I just got enough to eat. At the grassroots a lot of people want to be involved and want to do things but they can’t. They are just too poor. There’s such inflation now but no one’s income has gone up. Most people’s situation is like this: you can just survive on what you plant so people have to go out and labor. If you don’t go out and labor, you are just barely on a subsistence level. That wasn’t just true for my family but for many, many farming families in China. Do you think urbanization is beneficial to people? They can move to the city and earn more money. No, I don’t think it’s beneficial. Right now it’s a blind urbanization. Cities grow up naturally over time. Now they’re trying to do it all at once. The main thing about urbanization now is to make the economic statistics look good—to build and pump up economic activity. There’s nothing positive about urbanization? I think for those who go to the city and work there’s a benefit. But the current way of villages being turned into towns—I don’t think there’s an advantage to that. People in the village often rely on ordinary kinds of labor to earn a living, like working in the fields, or raising geese or fish and things like that. So now what happens? They turn a village into one high-rise apartment building and that’s all that’s left of the village. Then the land is used for real estate projects controlled by the officials. Where are the people supposed to work? How is that supposed to function? People abroad look at China’s human rights situation and they mainly see the situation of better-known people. But they don’t know about all the violations of ordinary people. You know my situation but you don’t know the situation of the huge number of the disabled in China, or the women who are bullied and abused, or the orphans in China. You probably don’t know much about them or just about a few of them. But this is why the officials are so afraid—because they know the true extent of the problem. They are terribly afraid of people organizing. It’s very delicate in the countryside now. This is why they constantly resort to detentions and so on. They don’t even try to find an excuse, they just do it—they are that scared. So officials are aware it’s tense in the countryside? There is nothing the leaders can do. There is a saying in China that if you are not correct, how can you correct others? Their sons and daughters have moved overseas and they are working in China all by themselves. How can they convince others? They gain money illegally together, and they get corrupted all together. They can’t blame each other. But they are very clear that if it continues like this they are going to be devastated. Will it be different after the 18th Party Congress this autumn [when the top leadership is due to be changed]? Every leader is different. Mao was different from Hua Guofeng and Hua from Deng and Deng different from Hu Yaobang and Hu different from Zhao Ziyang and Zhao from Jiang Zemin and Jiang from Hu Jintao. So Xi Jinping will be different. But even though they’re different they won’t voluntarily give up their power to the people unless the people go and struggle for it. You mean its up to the people to struggle? It is not that the responsibility lies with the common people, but they are gradually awakening. They are clearly witnessing all kinds of changes in society. So that’s why I say that Chinese society will inevitably change. The question is how. The best way is a constitutional protection of the law. If it doesn’t change toward this then people won’t be satisfied. This awakening you talk about, has technology been important? Yes, absolutely. The new technology has made news more free. It’s pushed China to a new level. It’s made it harder to cover things up. But Twitter is blocked; to access it you have to get past the Great Firewall of China. And a lot of activists are blocked from posting on Sina Weibo [the most popular Chinese Twitter-like service]. I think they can jump over that wall more easily than I jumped over my wall! Right now that isn’t the problem. The problem is that many ordinary Chinese can’t get online. Right now, the percentage of Chinese with cell phones is high but in the countryside Internet access is relatively low. So I think a lot of these foreign broadcasters are wrong to stop broadcasting in shortwave to China. In the past, we listened regularly to Deutsche Welle, Radio Canada International, and of course Voice of America. But countries are planning to scale back or even cut these services. This shows that these people don’t understand the situation in the countryside in China. If—or when—you return to Beijing, would you return to your village? If it’s up to me I’d live in the village but … I’m not blindly optimistic. I know the situation in the countryside very clearly. I know what’s going on and I can see the change. Look at Wukan. Look at Taishi Village. All these changes are happening in the countryside, not the cities. Because villagers’ sense of morality is higher or their situation is worse? Their sense of right and wrong is strong but also they are more down to earth. What do you think of urban activists? I don’t mean to condemn people in the cities. There are a lot of good people there. Most of them, however, aren’t too aware of the countryside. Many learned about the countryside after the 2008 earthquake in Sichuan when they went to see the destruction and found out about the corruption and the problems. Was this earthquake, for this current generation, like the June 4, 1989 Tiananmen massacre was for the last generation?